Company:Aqua Dynamic group, established in the United Arab Emirates is one of the leading engineering companies specializing in design, supply, construction and operation of water and wastewater treatment plants, utilities (reservoirs, pumping stations, networks etc.) 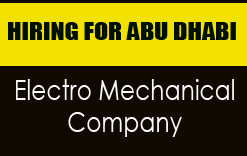 and electromechanical works. With a team of experienced engineers & technicians, Aqua Dynamic operates across complete UAE and provides cost effective engineering solutions in areas of MEP, HVAC, Fire Alarm & Fire Fighting Systems, Water & Waste water Solutions, Generator Installation & Maintenance and Panel Building works. Required Minimum 3 years experience in same field.